I’ll admit I’m a sucker for road trip stories. Classics like Oliver and Hal hitting the road to see the real America, etc. But when I pick up the first issue of B&R Hit the Road, I'm more reminded of Lloyd and Harry or Beavis and Butthead, and I love it! Bebop and Rocksteady are making their way north out of Mexico and back to the states via convertible. Apparently leaving destruction along the way, they’re on the run from the law as well. 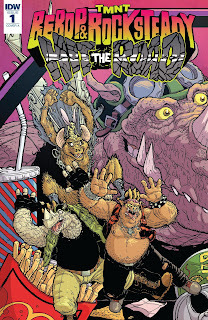 As they near the border Bebop suggests the duo abandon their unlawful ways and become good guys. Rock isn’t convinced until Bebop points out that the Turtles are good guys, and everybody likes them. Unable to argue with such logic, the two agree that they’ll start fresh on their return to NYC. On the way, they run into “U-Tube” star Hector Barres, and the alien desert monsters he's hunting down. Hector captures their heroics on film as they battle the mysterious and not fully explained beasts. Are they vampires? Aliens? Alien Vampires? It is yet to be revealed. Along with desert monsters, B&R have a whole lot more on their plate. On their trail is Special Agent Ravenwood, (who resembles Powergirl in a spook suit) who’s charged with isolating mutant threats. The fact that Ravenwood reminds her team that mutants have rights too, and violence should be a last resort, make her a more likable and refreshing character. If that isn’t enough, along the way the two realize they've been regenerating human body parts. As if their mutations are reversing, slowly returning them back to full human form. 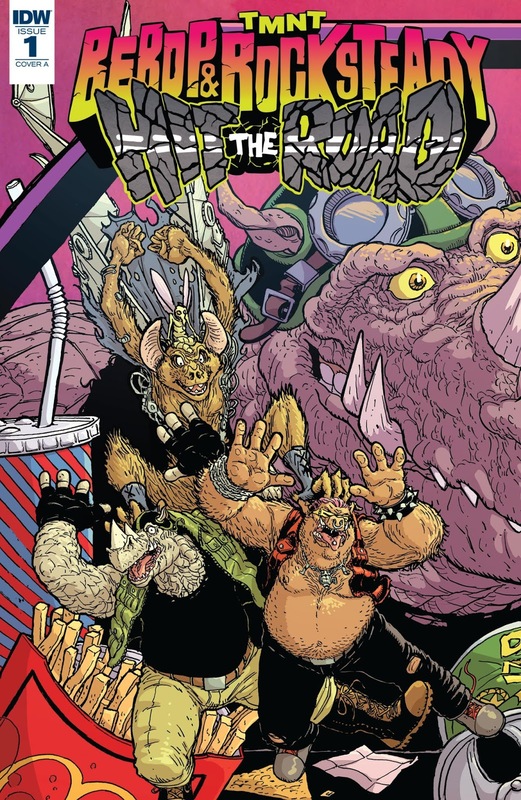 Is this the end of Bebop and Rocksteady as we know them? Is there an expiration on the secret ooze's effects? These questions definitely make this already fun story more intriguing. Bates and Weaver bring plenty of entertaining and humorous dialogue, atop of colorful and fun art. Certain page layouts were a bit confusing, but the script was strong and clear enough to carry the reader through any confusing paneling. 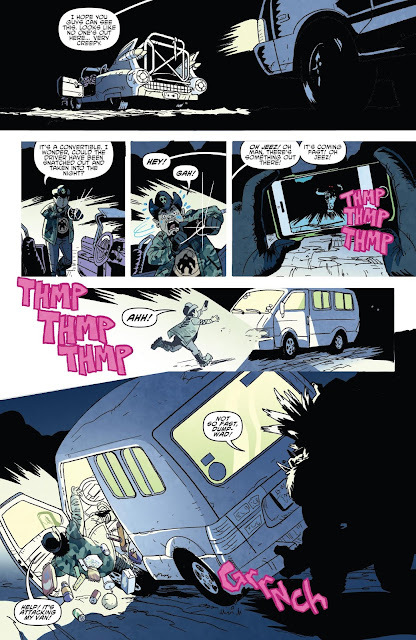 The panels themselves were action packed with colors that matched the story's tone, and strong word art and lettering being as much a part of the story. Altogether the blend of a great script and bold yet simplistic art make this an issue #1 worth picking up, and a series to look forward to.